I had a craving for peanuts and chocolate last night, so I decided that I would whip up something fun. 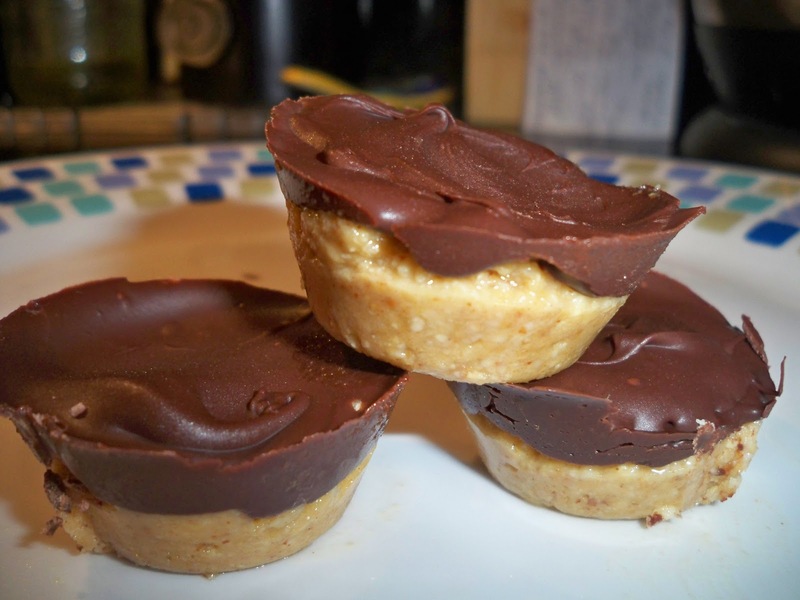 These nut cups are modified from the protein bars I made previously, and are quick and easy to make, no cooking (unless you count a microwave for a few seconds) and yummy. I even had a few for breakfast. 1. Spray a mini-muffin tin with nonstick cooking spray. 2. In a small food processor, combine almonds, cashews, flax, sunflower seeds and peanut butter until it forms a paste. 3. Heat coconut oil, sugar, honey and vanilla in a small bowl in the microwave for just 15 seconds. 4. Pour coconut oil mixture into nut mixture and process until mixed (just about 10-15 seconds). 5. Put about a TBS of mixture in each tin and place in the freezer while you make the chocolate. This made 24 cups. 6. Heat chocolate in microwave for 20 seconds, then stir, then heat again for 10 seconds. Keep doing this until it’s all melted. Be careful not to overcook. 7. Remove cups from the freezer and put about a tsp of chocolate on top of each cup and spread it out. Work quickly, it cools and hardens fast on the cold nut mixture. After you’ve put all the chocolate on, you can add more if you like. 8. Return cups to the fridge or freezer (depending on how fast you want to eat them). 9. When hardened, remove the cups from the tins and put in an airtight container in the fridge. They melt quickly so keep them in the fridge. Up until just a few weeks ago, I could not find a protein bar/snack that I wanted more than once. I’ve been trying to find a good packaged one for years. But all of them taste terrible. I like Lara Bars, but they are sticky and lacking chocolate. They are good for long plane rides and such. Recently, I visited a new breakfast joint in town, Over Easy, and they have a wonderful house-made protein bar. It listed almonds, flax meal, coconut and chocolate. It was a hit. I loved it, but at $3 for each 2″ square, I realized I couldn’t hang out there every day when I wanted one-I’d go broke. So, I came home and tried to make it on my own. After a few tries that were great, I came across a version of it on Elana’s Pantry (see link on right). Elana makes some wonderful GF food on her site and I love looking for new ideas. 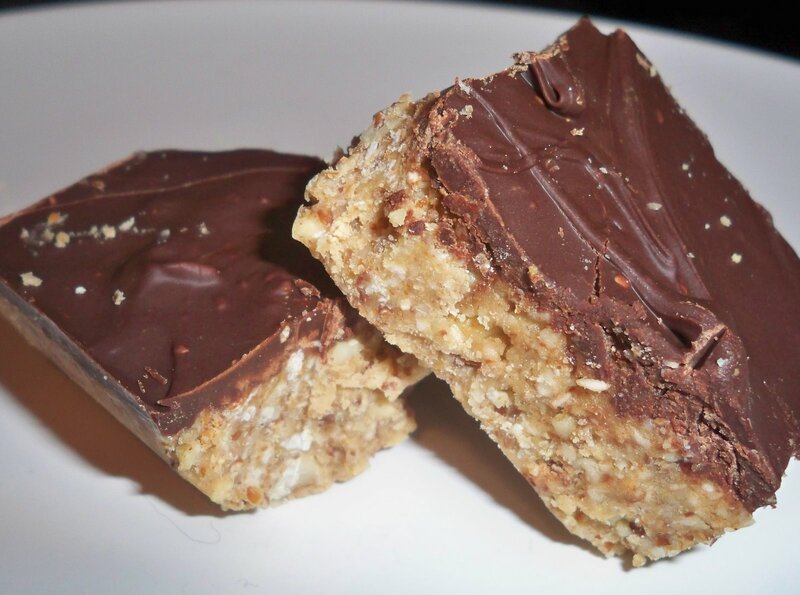 I tweaked both Elana’s and Over Easy’s recipes and came up with what I call my Almond/Cashew Protein Bar. So far, I’ve been told by a few people that I should sell it, it’s so good. It’s salty and sweet, crunchy and filling. I love the chocolate on top, just enough to sweeten the deal. It’s like eating a candy bar that’s good for you. It’s just hard to stop, although a little goes a long way. Give it a shot and let me know if you change it in any way. I’ve thought about adding dried fruit, or some raw pistachios-the possibilities are endless when you think about it. 1. Mix first six ingredients in a food processor for about 20-25 seconds, should still be coarsely chopped and mixed. 2. Heat coconut oil over low heat and remove. 3. Add stevia, agave and vanilla to coconut oil and stir. 4. Pour coconut mixture into almond mixture in food processor slowly until completely mixed. 5. Pour mixture into a sprayed 8×8 glass baking dish. 6. Refrigerate for about 30 minutes. 7. Melt chips in microwave for 20 seconds, stir then microwave another 20 seconds. Continue until chips are melted. Do not microwave too much or you’ll ruin the chips. 8. Pour chocolate over bars, spread evenly and return to fridge for at least 30 minutes or longer until hardened. If you’re going to save these, as I do, to eat in the next few days, store in an airtight container in the fridge.